Viewing a thread - Cruisin's cool but who goes RACIN!?!?!?! Cruisin's cool but who goes RACIN!?!?!?! Subject: RE: Cruisin's cool but who goes RACIN!?!?!?! A Nascar history buff thought that since the wagon has a NASCAR logo on the door, it was most likely a track vehicle used to keep the field of cars in place during only the "warm-up" laps. That would make complete sense. Way more sense than trying to figure out why somebody was racing in a Dodge wagon. I know they were popular in the 1960's as drag cars because of the extra weight over the rear wheels for traction but as a roundy-roundy turn left car, it would make for some interesting (scary) polar moment of inertia situations. 'toga party at Perth Motorplex. Nostalgia Drags April 2017. Not just any 56 Dodge, a Coronet 2dr D500. If I had to guess, it would have the 2 four bbl carbs and a 3 spd manual trans, i.e. this baby is going racin'. The photos also confirm how the wheels were painted at the factory, i.e. white rims and grey centers. This '56 may have started out as a D-500, but at the stage of the game when the pic was taken, the drag class it was in was C Gas (note the "C/G" on the left rear window). The NHRA Gas classes were for cars that had engine or trans modification that differed from NHRA approved stock configuration (these generally followed the published AMA specs). There were five gas classes that were classified according to total car weight divided by total engine displacement cubic inches. Designations were A/G, B/G, C/G, D/G or E/G and "gas" meant the use of pump gas, not "nitro," AVGAS, or alcohol. The use of a supercharger moved you up one class. The car does seem to have slicks on it which in themselves in those days would take it out of a stock class. Location: Lower Mainland BC Joe: Thanks for the info. My 1956 Dodge AMA sheets have the D63 D-500 at 3605 lbs. At 315 cu. in. that makes for 11.44 lbs per cubic inch. Right in the C/Gas range, as per the photo. Funny that NHRA wouldn't say anything about single 4 bbl versus 2 x 4 bbls. The thing that drove the NHRA, AHRA, USAC, and even NASCAR was the AMA specs. Any fuel induction system posted therein was acceptable, witness the 2X4V carbs on the C300s and 300Bs. In 1957, NASCAR adopted a harder line, allowing only a single four-barrel, at most, while Chevy could compete in the stock classes with 2X4V carbs and even fuel injection; T-Birds could have the Paxton supercharger option. That Dodge might have had some non-AMA internal parts or even racing slicks rather street tires which might have put it in with the Gassers. As a matter of interest, "cheater slicks" which I recall being really slicks with some rather dubious grooves running longitudanally on the edges of the tires kinda emerged in the '60s. I know full slicks were verbotten for the stock classes at the strips I frequented in 1960 and 1961. Not to say there weren't some interesting things done back then. For example, Al Eckstrand had the Chrysler shop fashion him his "Fury 300", a '59 Sport Fury with a 300E 380 HP/413. I understand that the guys even made the Sport Fury roundels into "Fury 300" types, plus he tried to pawn off some documentation that was truly a Chrysler product, but it didn't work and he went into a gas class. I was also told by a Ramcharger that a few RB-383s got into '60 Darts and Plymouths and were passed by the racing body inspectors, but I haven't been able to substantiate that elsewhere. Location: Georgia Great photo! Note the tow vehicle is a '61 Plymouth wagon! Location: jersey 526 stroker, '65 cable shift 727 w/RMVB( kept the pushbuttons) 3.23 suregrip. friends talked. At least he wasn't texting and drag racing ! - Please note the engine colors, red block with gold valve covers, ram tubes, and air cleaners. This was the official color scheme for the '60-'61 sonoramic engines, either the 361 or the 383 CID version, although considering how assembly lines sometimes work, various other versions can well have come about. Since no '61 413s ever came off the assembly line in the '61 model year as they were "dealer-installed" or special order options, only God knows what color they might have been. I was fortunate to have talked with Jim Thornton who handled some of the driving on the Ramchargers' '61 S/S Pioneer and he said that the car they got from Taylor Dodge in Detroit did have the 413 in it when he first saw it, but he didn't know how it got there. Al Eckstrand didn't have any info either. The black-and-white pics I've seen of that engine don't give much of a clue as it doesn't have air cleaners and the valve covers are chrome. - The carb linkage is also interesting. It is the early ball-joint type that was superseded fairly soon into the model year by the more familiar slotted rod. I have a copy of a tech letter from Chrysler stating that the early model should be replaced by the later one, but somehow or other my early production '60 Fury kept and still has the old version. According to my December 1959 copy of "Rod Builder" the gentleman in the bottom photo with the SonoRamic Commando engine is Jack E.
versions can well have come about. Since no '61 413s ever came off the assembly line in the '61 model year as they were "dealer-installed"
or special order options, only God knows what color they might have been. either. The black-and-white pics I've seen of that engine don't give much of a clue as it doesn't have air cleaners and the valve covers are chrome. - The carb linkage is also interesting. other my early production '60 Fury kept and still has the old version. I hope the photos aren't too morbid, but it's a good reminder to be careful out there! 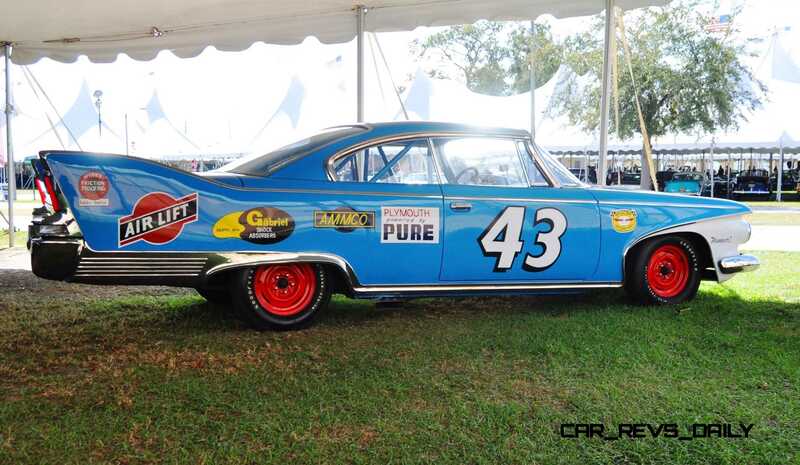 museum, as a reminder of the image of Petty's #42 Plymouth sailing out of the speedway. Location: northern germany I posted pictures of that 61 Plymouth wreck in the museum some time ago, showing its suspension mods. Location: So. California I'm not sure if this has been posted before, but I thought this film from '59 is a nice look into drag racing back then. It has mostly GM vehicles in it, but there is a Plymouth 2dr hardtop at the 13 minute mark, a '57 Dodge camper at 9 minutes, the original ramcharger race car at 22 minutes, the president of Chrysler & general manager of Chevy at the 23 minute mark, and a lot of blown hemi's in the winner circle. I doubt you would see the heads of American car companies attending drag races these days. There was some discussion about what engine it would have, it being suggested that they'd have been running a 291 De Soto engine. Would that be right? I think the 6-carb engine in the dragster is actually a Dodge Hemi, as opposed to a Chrysler.